There is something very special about services like this. Opportunity to gather together as Christians from different churches in this town. Why the Bible is so important. The second declaration on our vision statement is that we seek to teach the Bible in a way that is relevant to everyday life. I would like to look at the passage that we have had read from 2 Timothy. It is a letter written by Paul, an experienced minister of the gospel, to Timothy, a younger man who is pastor of a church in Ephesus. And our verses today tell us why the Bible, why Scripture, is so important. At the beginning of this new year, we’re beginning a series of 5 sermons looking at the 5 declarations of our vision statement. You can find those declarations every week on the top of the notice sheet. And the first is about worship: ‘We seek to worship the God and Father of our Lord Jesus Christ in the power of the Spirit’. And our passage today is appropriate. It is the set passage for the Epiphany. Epiphany means the making known, the revealing, of the truth about Jesus and about God. It tells us of the wise men. They are not kings. 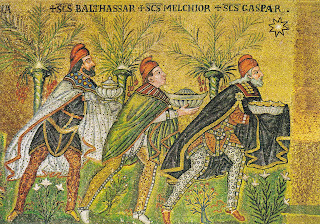 They are probably not called Balthasar, Melchior and Gaspar. Sorry! We are not even told that there were three of them, although there were three gifts.